this minitutorial i’m using the terminator on the right which comes from a new space hulk set. 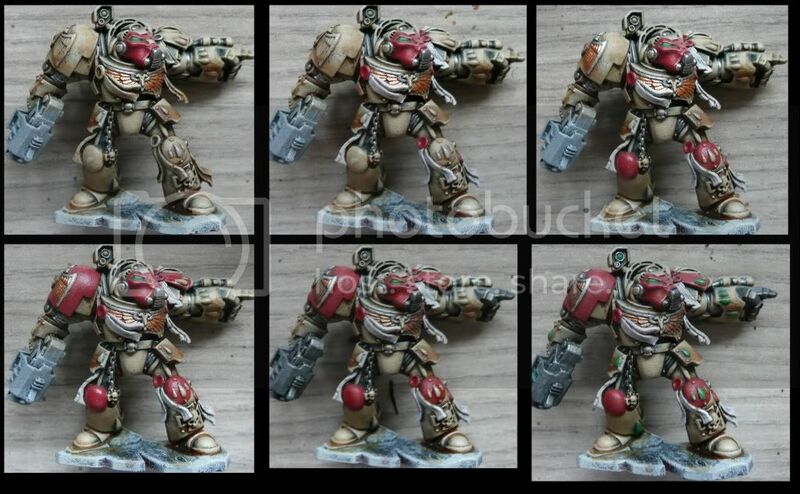 the reason i’m wrtiting this article is, because i was asked to describe my technique quite ofter, after i was mentioning that this paitinscheme allows me to paint a complete miniature within less than 100 miunutes. a reason for this is, that the basic colors are based on drybrushing and inking. 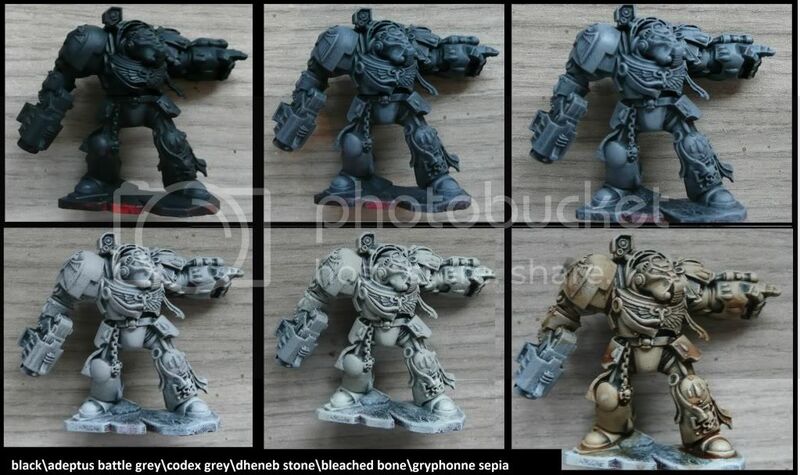 adeptus battlegrey => codex grey => dheneb stone => bleached bone. than, after inking the mini with gryphonne sepia and waiting until it dried (i’m normally using a hairdryer to speed it up a bit) it should look like terminator in the lower left corner of the picture shown above. and that’s it for the basic scheme. now it is time to apply some details according to your individual taste. 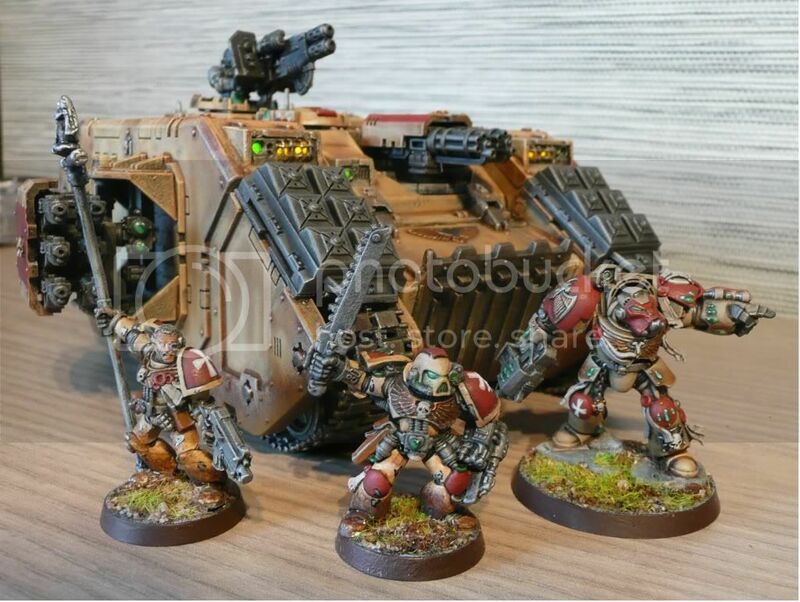 i was mainly using mechrite red inked with gryphonne sepia and boltgun metal/dwarf bronze inked with bhadab black this time. the seal are colored with 2 layers of dheneb stone and the gems with snot green/dark green ink and some white. Absolutely staggering. All of it. All the time. Long have you been an inspiration to my muse and me. Thank you, for your insanity, and your dedication to perfecting it. Amazing. I need a tutorial, or several hundred.